The switch from Google Talk to Google Hangouts has left some users confused. With the old GTalk client, you could easily see who was online, idle or offline. With Google Hangouts, it’s a little more difficult. 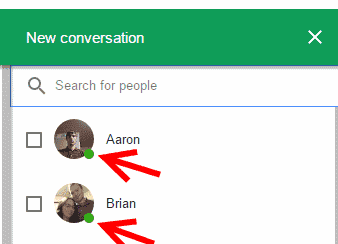 Here’s the best way to tell if people are online in Google Hangouts. 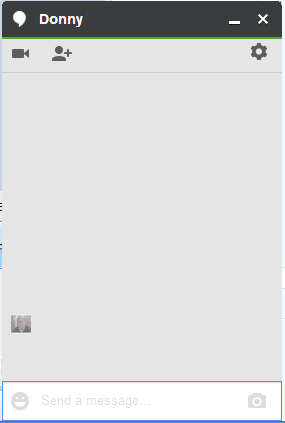 Using the Google Chrome Hangouts Plugin in Windows, you have a few indicators on a user’s status. Users who are online and active will have a green dot next to their icon. Users who are offline also won’t have any indicator from the friend list. 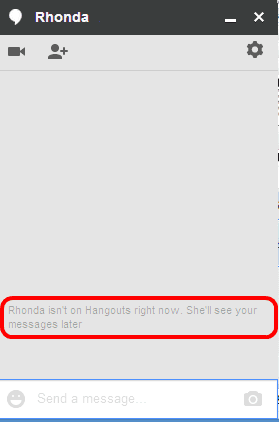 However, if you open a chat window, a message will appear that tells you they are not on Hangouts right now. Users who are online and idle won’t have any indicator from the friend list. You will have to open a chat window to see if the person is online. The window will appear without any type of indication. What about Android users? Well sorry. At the moment there doesn’t appear to be a way to tell if users or offline or online. The lack of clear indicators on the friends list has been an annoyance to many users on all versions of Hangouts. Hopefully Google will fix this problem with an update in the future. I feel like when it says “Active Now” it doesn’t necessarily mean that they’re on the Google Hangouts app.. it could mean that they’re active on other Google apps such as YouTube. Because remember, Most Google apps require you to be logged in and they could be logged in with their account on YouTube just watching videos and ignoring your messages and Hangouts probably sees that as “active now”. Kinda like Facebook, you could be scrolling through your timeline on the Facebook app and it’ll still say “active now” on the Messenger app, and it’s a whole seperate app but it’s logged into the same account.